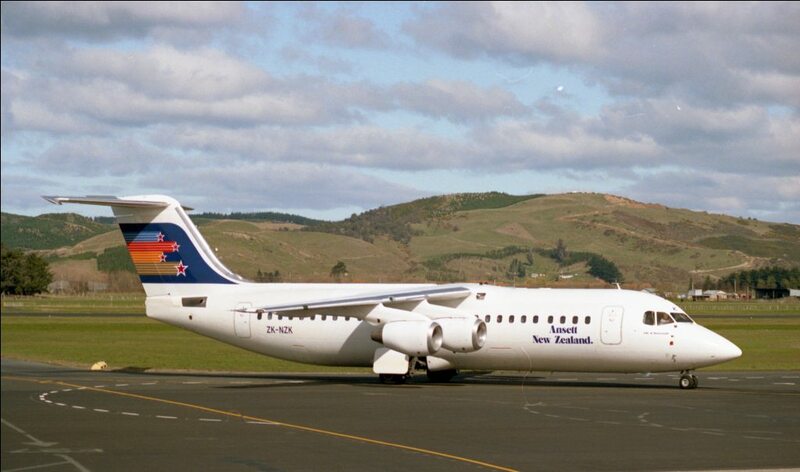 Greetings and Kia Ora folk from the Wellington airport, a very different look from my Pitt Island view. Here I am sitting in a very different place looking at the many varied people coming and going and drinking a cappuccino. 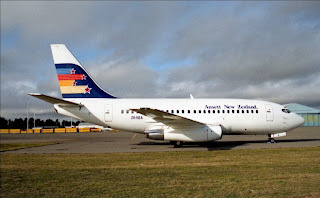 The idea is to write this article while waiting for a much later flight to Timaru, but the fascination of watching these variations of humanity is very distracting. One hears about fashion, reads about it and sees it on TV. 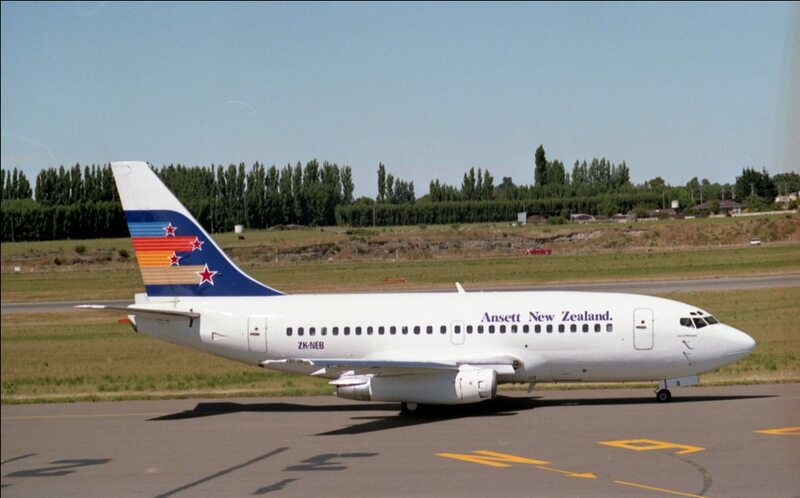 I’m telling you folk I could wear my pyjamas here and no one would look sideways. 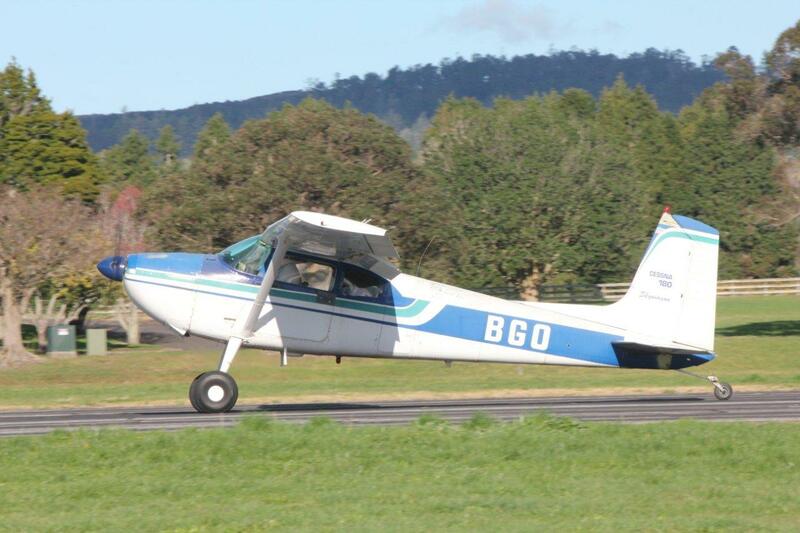 Going back a few paces firstly was the return of the baby plane to Pitt. Yes, folk, it has returned after a good while so thank you Craig and Air Chats. 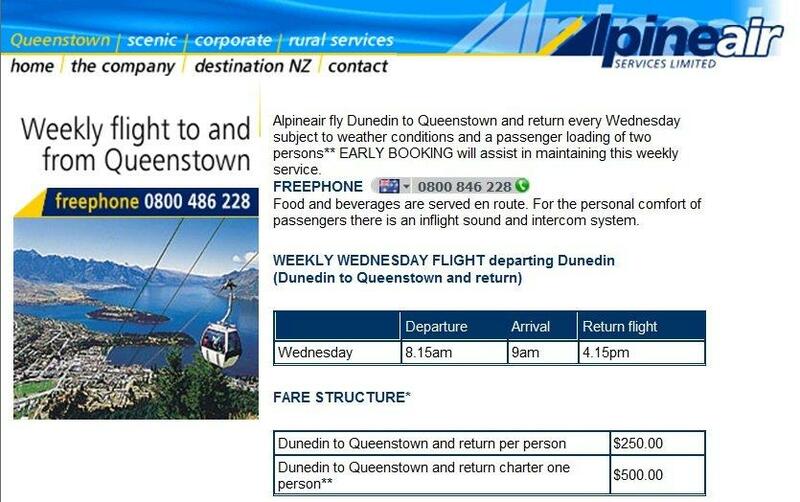 Without a doubt it is convenient, so much quicker and one doesn’t have to think about sea sickness. 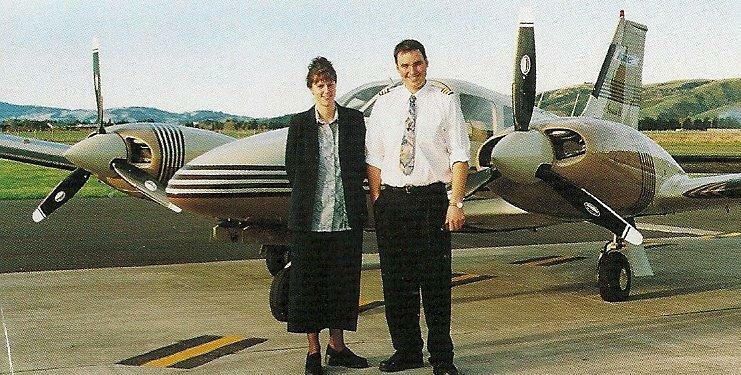 If one had to ditch it so to speak, I’d have forgotten where the axe was, how to dispatch/open the life raft and in the confusion totally forgotten was I meant to do something with the life jacket. Thankfully that has not been necessary as I have complete faith in the pilot, the plane or the boat and the skipper in the dozens of times crossing Pitt Strait. 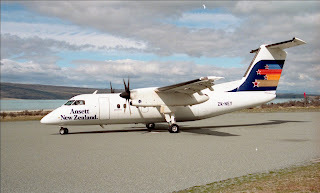 Over the years when crossing Pitt Strait mostly during sea sickness, have thought do I say an Our Father, a Hail Mary or just plain bugger and leave it up to those at the helm and they’ve always delivered me safely to my destination, whether by boat or plane. 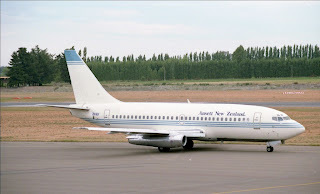 Leaving our Pitt airstrip in gum boots and overalls due to wetness and muddy gateways along the way and arriving in Wellington in shoes and taking that long walk from the plane into the inner terminal on concrete, then carpet is a different feel on the feet than the usual farm land feel. 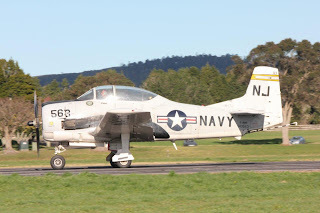 It is definitely gum boot weather at home and we have clocked up a bit of rain in the last week or two so no mud will be a nice change. 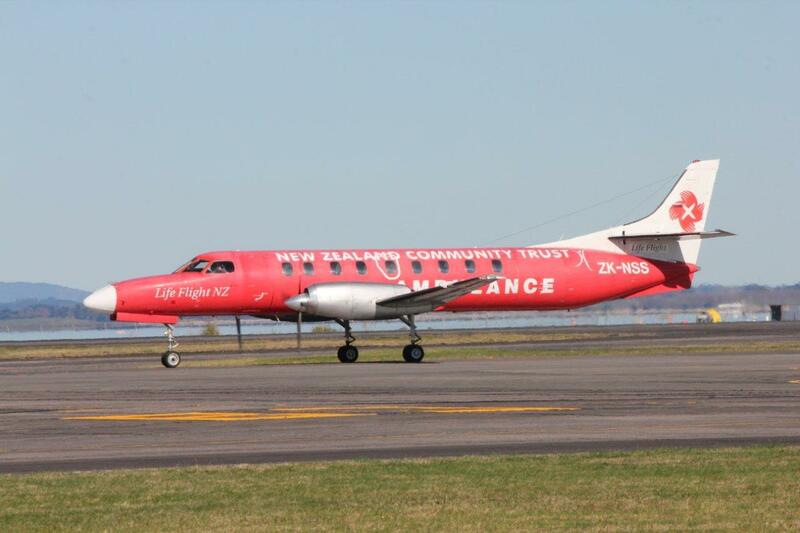 Our flight to Wellington was pleasant and seemed quite fast arriving before midday NZ time. 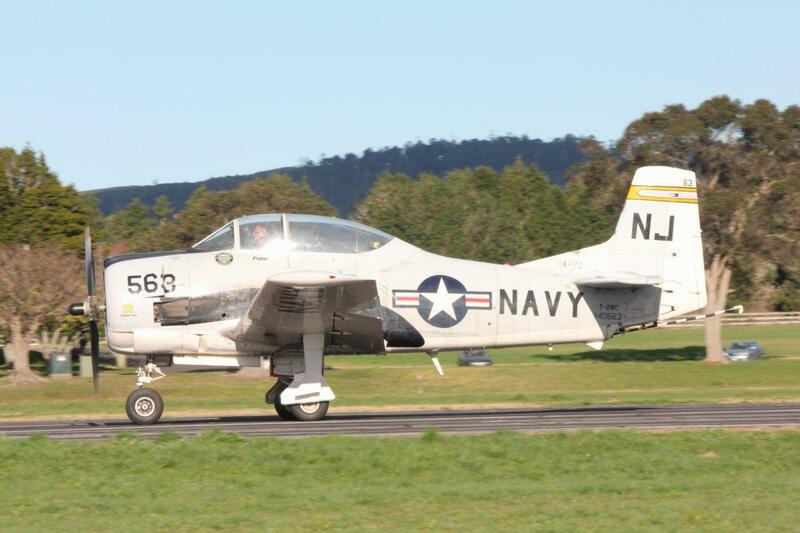 As I now look out this window in front of me a misty fog is coming down so we were fortunate indeed. The hills in front of me are smothered in houses people living cheek to jowl in such closeness it would be suffocating, but perhaps not for those who do as that is possibly the only life they know. The longer I live and the older I get, I will be forever thankful for where I live and how I live as well, to me it is very earthy, natural and satisfyingly complete, but understandably not everyone’s cup of tea or cappuccino for sure. 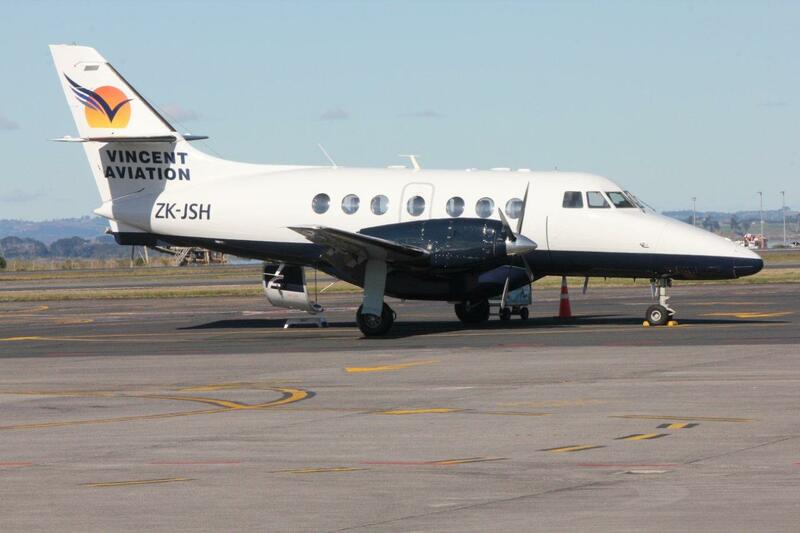 Vincent Aviation's newest aircraft, BAe Jetstream 32 ZK-VAH, entered service yesterday flying services for Air New Zealand Link's Eagle Air flying a Wellington-Wanganui, and a return Wanganui-Auckland service. 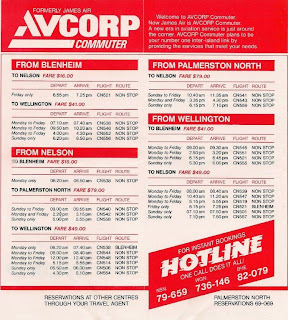 Today, as well as its normal scheduled morning Wanganui-Auckland service and return evening service, it was used for services from Auckland to Tauranga, Hamilton and Whakatane. 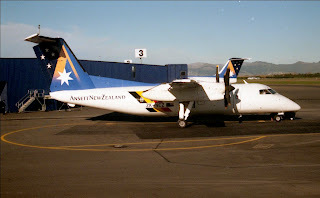 In 1980 Aviation Corporation Ltd bought Nelson based James Air. 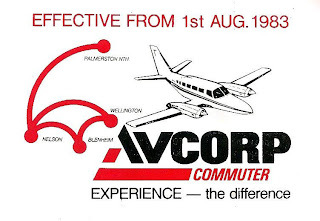 The airline continued to operate as James Air until it was rebranded as Avcorp Commuter on the 1st of August 1983. 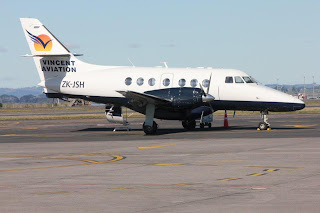 Earlier that year the Beechcraft agency was advertised as being held by the Aviation Corporation, and in mid-1983 Aviation Corporation Ltd introduced an air charter service out of Wellington using a a pressurised Beechcraft B60 Duke, ZK-SIH (c/n P-525). The aircraft was also available to be used as a back-up aircraft for James Air/Avcorp Commuter scheduled services. The Beech Duke, ZK-SIH, which was used primarily for charter, at Nelson on 26 November 1983. 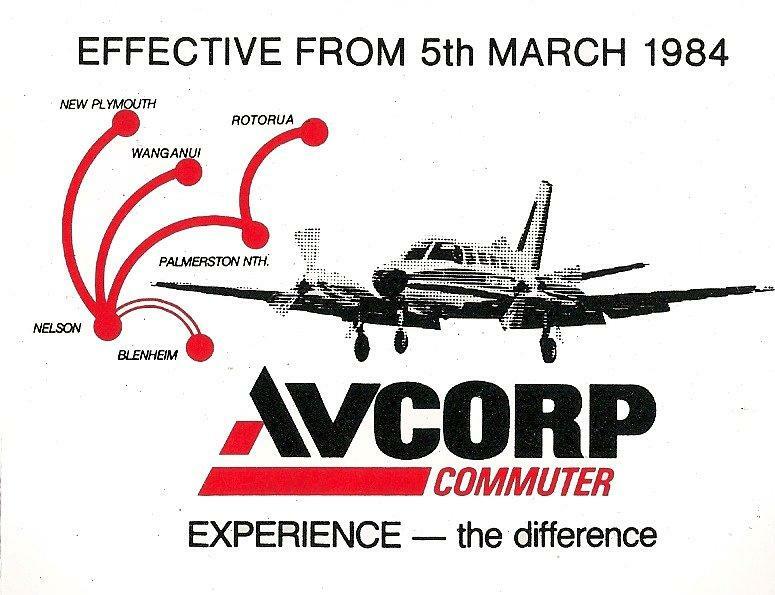 At the time of the rebranding Avcorp Commuter were operating services between Nelson, Blenheim, Wellington and Palmerston North using Cessna 404 Titan ZK-TAT (c/n 404-0080), Aero Commander 500A ZK-DCF (c/n 500-A-1274-97) and leased Cessna 402 ZK-DSG (c/n 402B-0559). 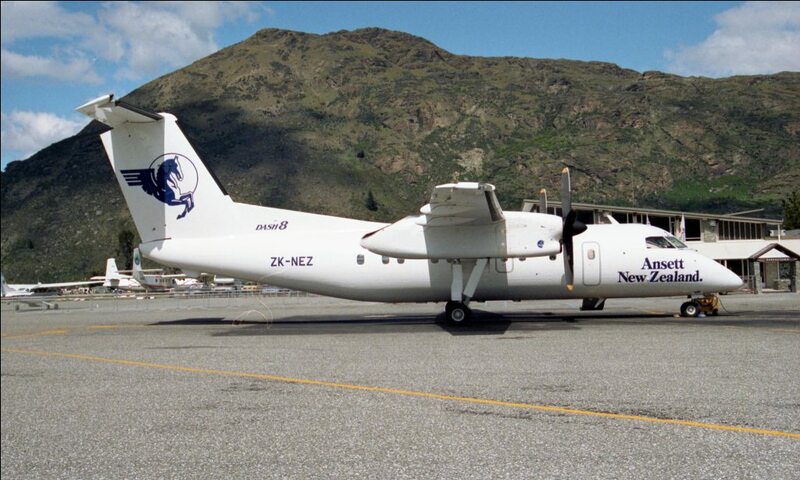 Aero Commander ZK-DCF at the Nelson air show on 15 April 1984. 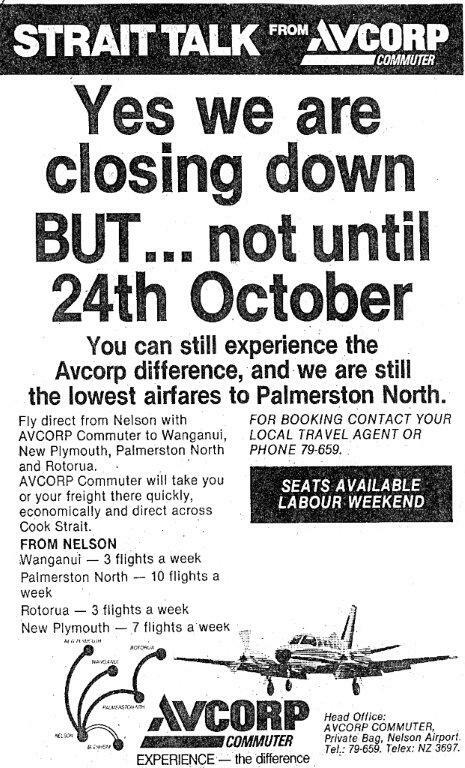 The company was interested in developing new routes and so in late August 1983 Nelson-New Plymouth and return air service was launched. 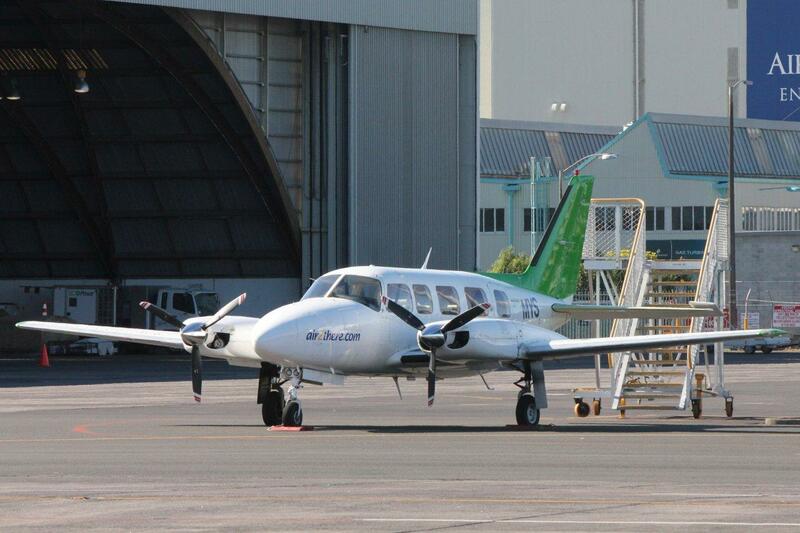 It initially operated as an air-taxi service while permission was sought to add it to its scheduled licences. 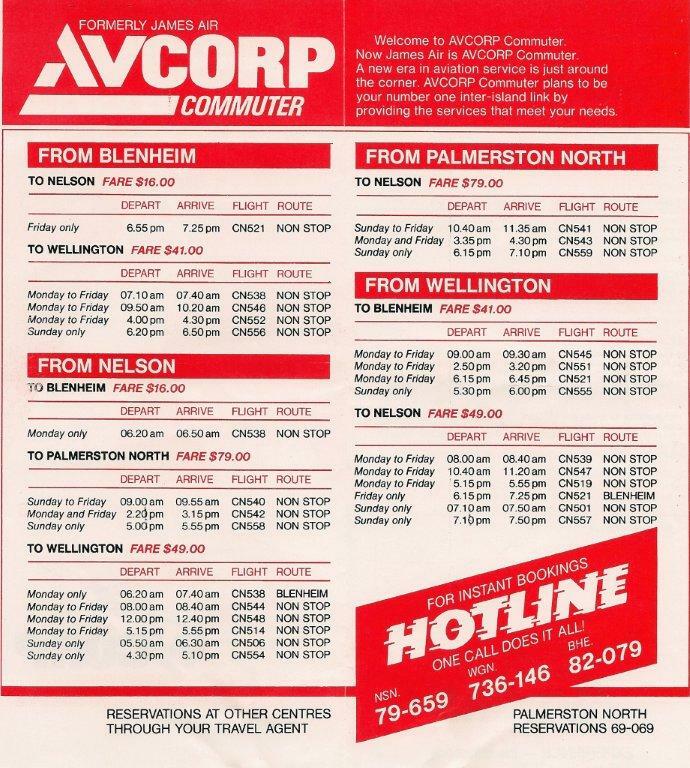 The trice weekly northbound service left Nelson for New Plymouth at 9.10am Monday to Friday, arriving about 10.20am. 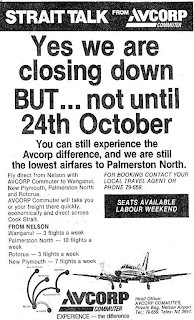 The return service would leave New Plymouth at 10.40am to arrive in Nelson about 11.50am. 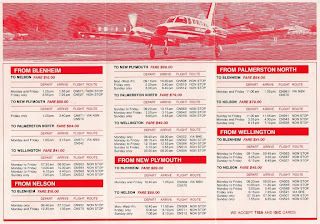 The New Plymouth flights proved popular and additional Friday and Sunday services were added from the 5th of December 1983. 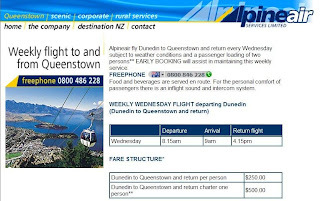 The company also offered discount fares to stimulate business. 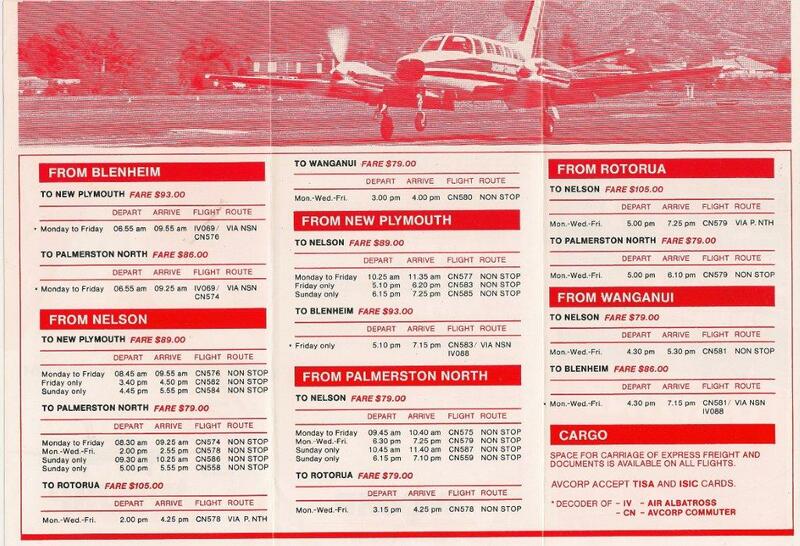 December 1983 also saw the arrival of Air Albatross’ 18-seater Metroliner on Cook Strait services. 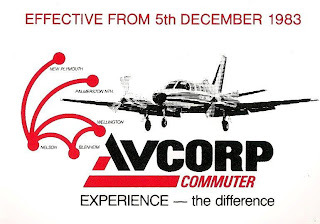 The new competition was too much for Avcorp Commuter and, after discussions with Air Albatross, the airline came to the conclusion that the two airlines should complement each other’s’ services rather than competing against each other in a highly competitive market. 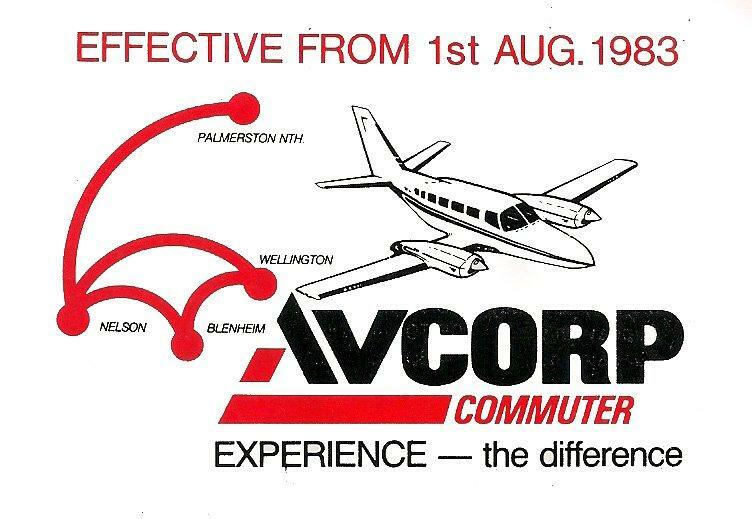 Avcorp made the decision was made to cut its Nelson and Blenheim services to Wellington from the 5th of March 1984 and at the same time to expand its services from Nelson to include Wanganui and Rotorua. 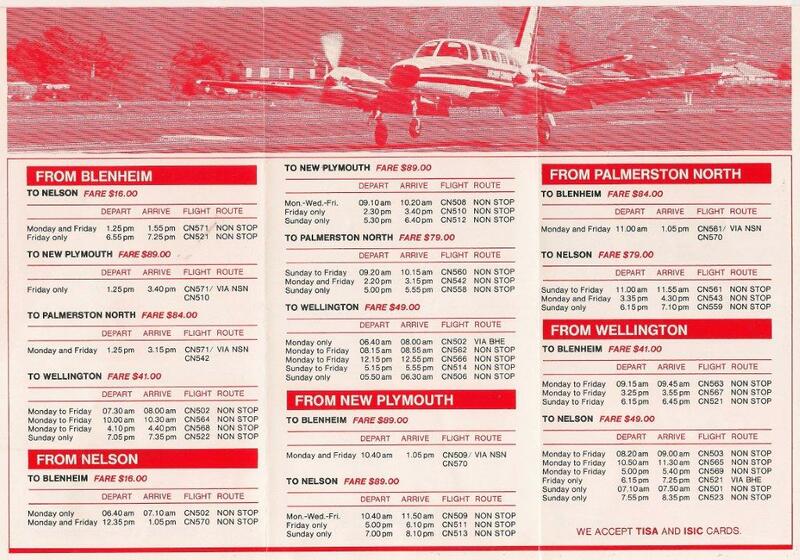 The Cessna 404 Titan at Palmerston North whiilst on a scheduled service from Nelson 21 August 1983. 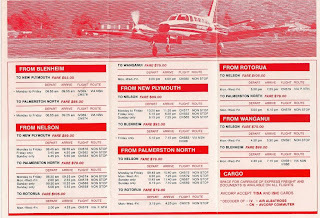 Leased Cessna 402, ZK-DSG, at Nelson on 26 November 1983. Avcorp Commuter ceased its airline service on the 24th of October 1984. 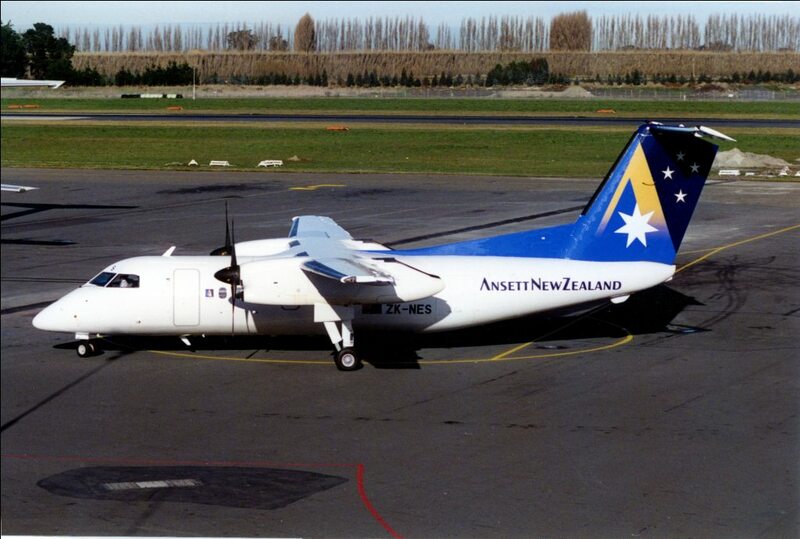 DHC Dash 8 ZK-NEZ with Ansett New Zealand titles but still with the Ansett Newmans logo. 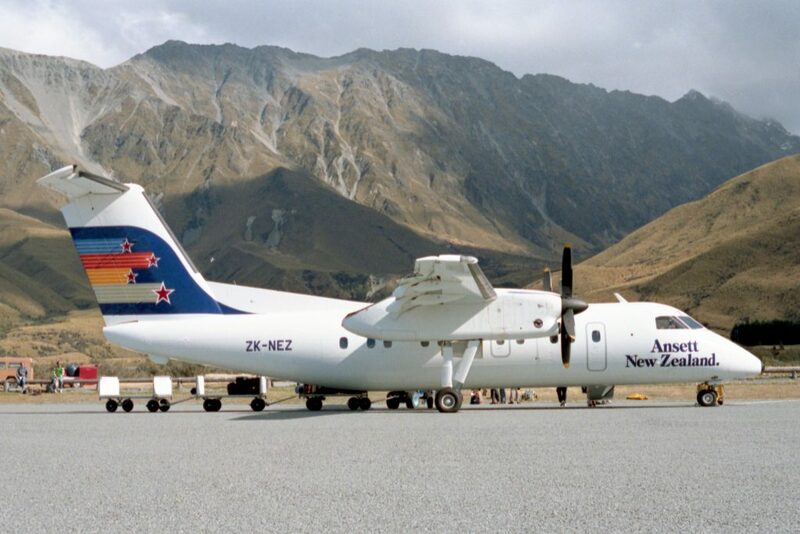 Photo taken at Queenstown on 24 October 1987 by S Lowe. 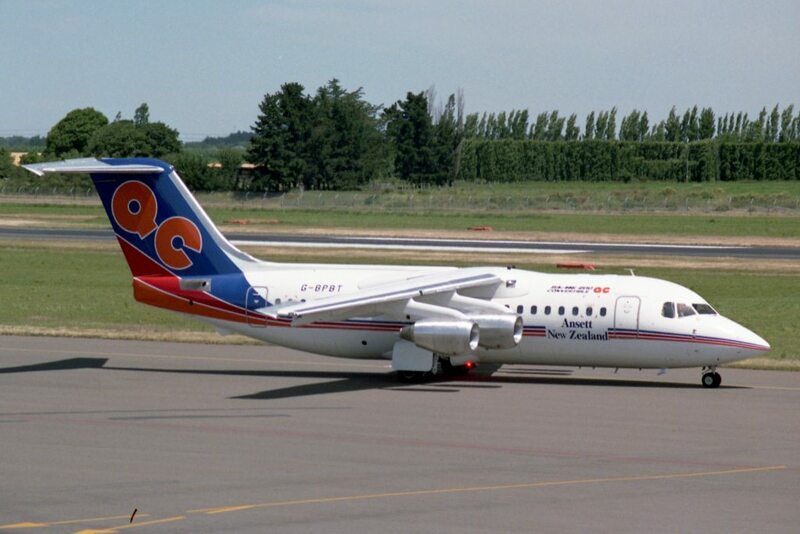 I can't see getting access for a photo like this now! Ansett New Zealand was the result of Ansett Australia's desire to expand into the New Zealand market, enabled by the relaxation of regulation in the aviation sector by the fourth Labour government. 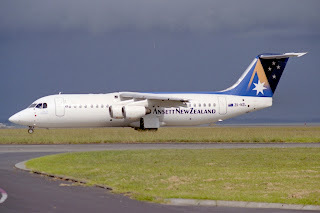 Ansett Australia formed a partnership with two New Zealand companies, Brierley Investments and Newmans, the latter being a tourism company which owned the unprofitable Newmans Air. 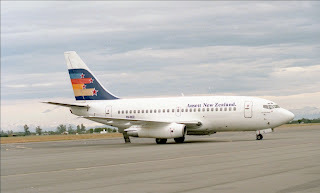 Newmans Air formed the basis for a new expanded airline, the company being Bilmans Management Ltd, operating as Ansett New Zealand. 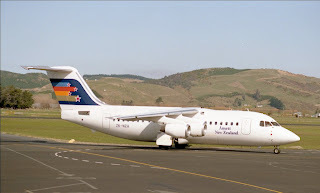 It began operations with 3 Boeing 737-100 aircraft between Auckland, Wellington and Christchurch and the ex Newmans air Dash-7s were used on tourist routes Between Auckland, Rotorua, Christchurch and Queenstown. 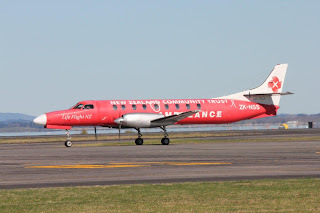 The airline was known for its quirky TV advertisements - the businessman who boarded the plane with his wife's keys ("I gave them to the pilot," the hostess reassures him, "and he threw them out the window") or Fluffy, the bedraggled cat that accidently ends up at the airport. 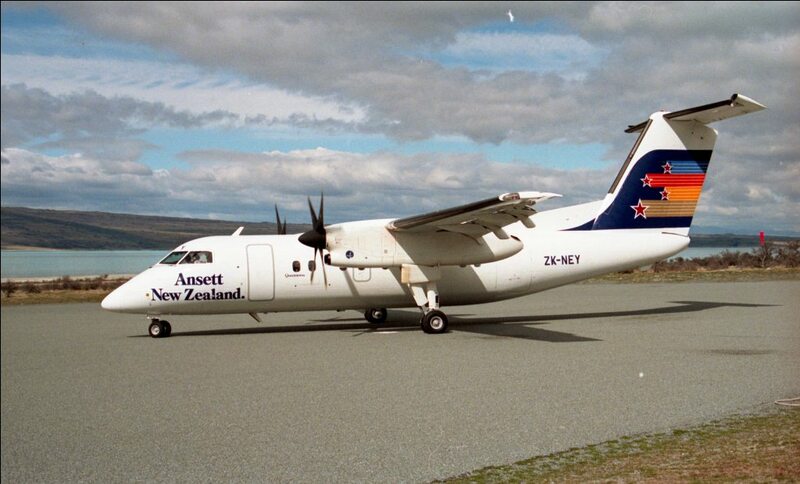 Ansett came to the rescue both times with the phrase, "what a big difference a little extra service can make". 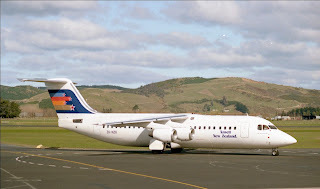 Mystery weekends, where passengers turned up to the airport and were flown to an unknown destination within New Zealand, were also a hallmark of the airline. Ansett introduced the "Golden Wing Lounge" - a precursor to today's Koru Club - was introduced, and full meals and a bar service were included, even on regional flights. 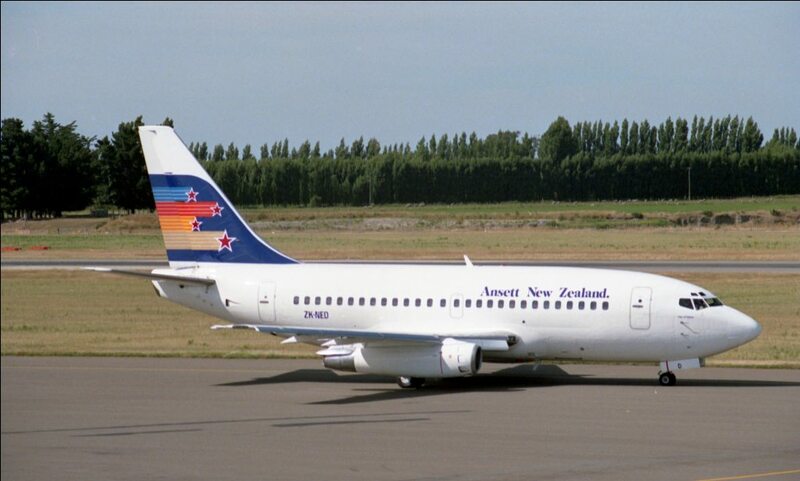 While Air New Zealand would probably have introduced these innovations eventually, Ansett certainly sped up the process. 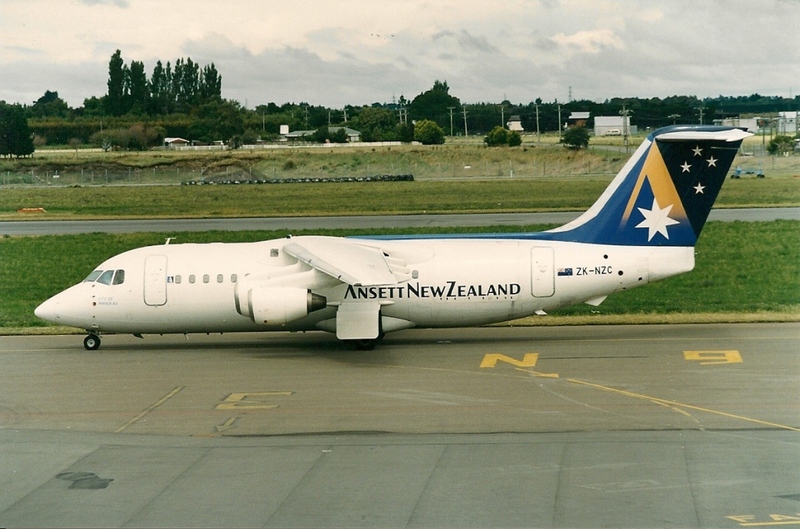 While Air New Zealand in Wellington operated out of an old hangar, Ansett built a whole new building attached to the old international terminal. 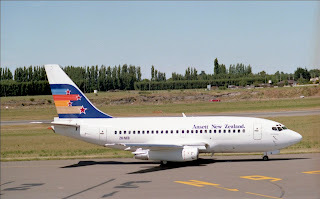 That was followed in 1988 by the introduction of the new-wave "Whisper Jets", replacing the noisy older jets. It took eight years, but in 1995 Ansett NZ celebrated making a profit. 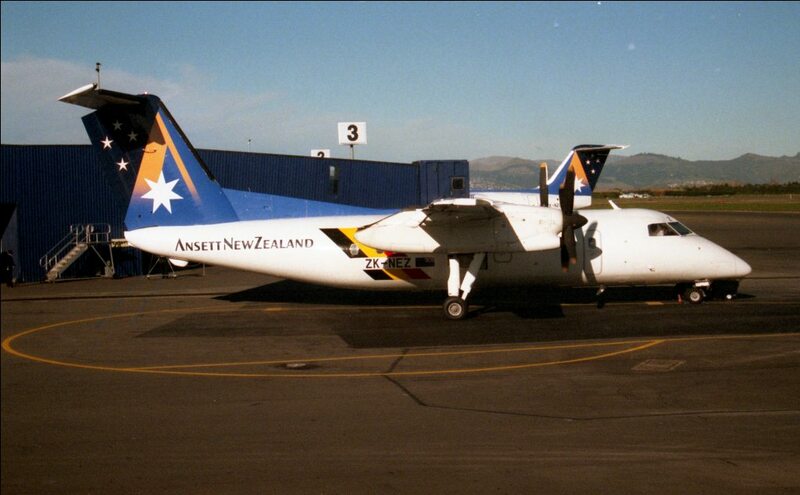 Ansett New Zealand stopped services in 2000. 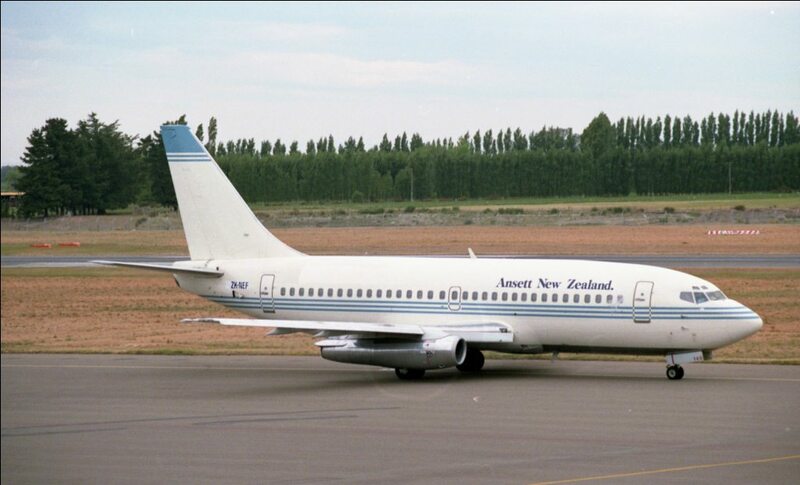 Operations started in 1987 with 3 Boeing 737-100 aircraft (actually some of the oldest in the world - see below) between Auckland, Wellington and Christchurch. 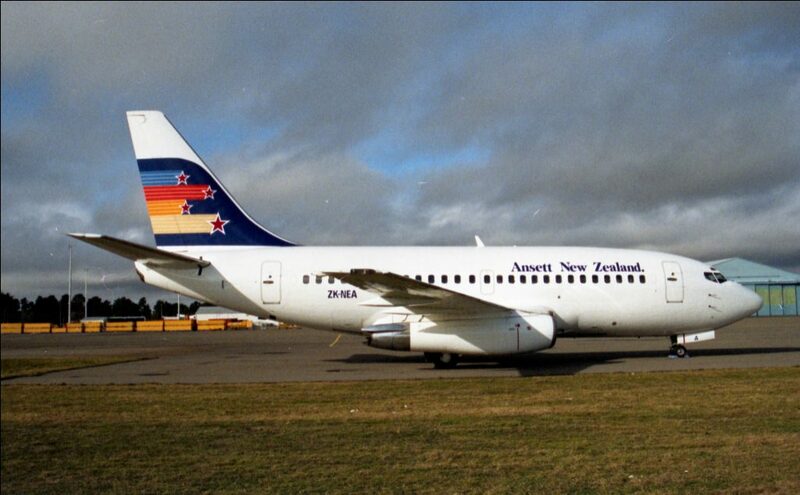 Air New Zealand actually used this when Ansett took it out of service, as a maintenance replacement. 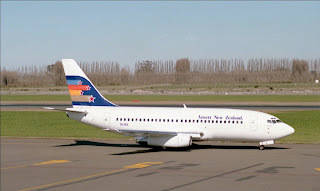 It was all white with a navy colored Koru on tail. 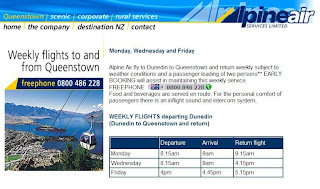 Alpine Air Services was a Dunedin based company formed by Charles and Helen Thompson in September 1999. 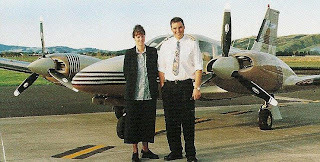 Charter operations began in 2000 using Piper Pa34-200T Seneca II ZK-TBF (c/n 34-8070087) with Charles being the chief pilot and managing director and Helen the Administration and Tour Coordinator. Piper Seneca ZK-TBF at Dunedin on 6 August 2001. Regular flights between Dunedin and Queenstown began in July 2000. 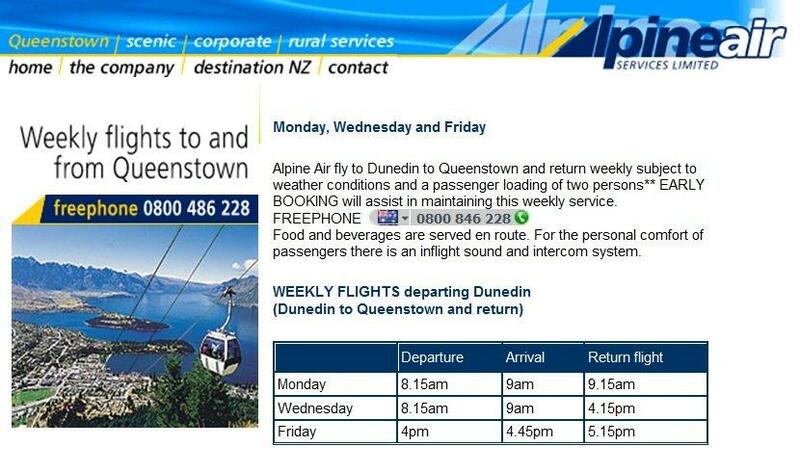 Flight operated on Mondays, Wednesdays and Fridays subject to there being at least two passengers. Flights would also land at Alexandra or Wanaka on demand. 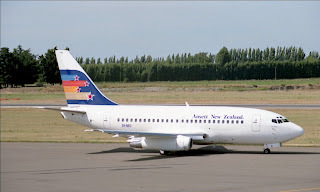 By November 2001 the service had reduced to a weekly flight on Wednesdays. 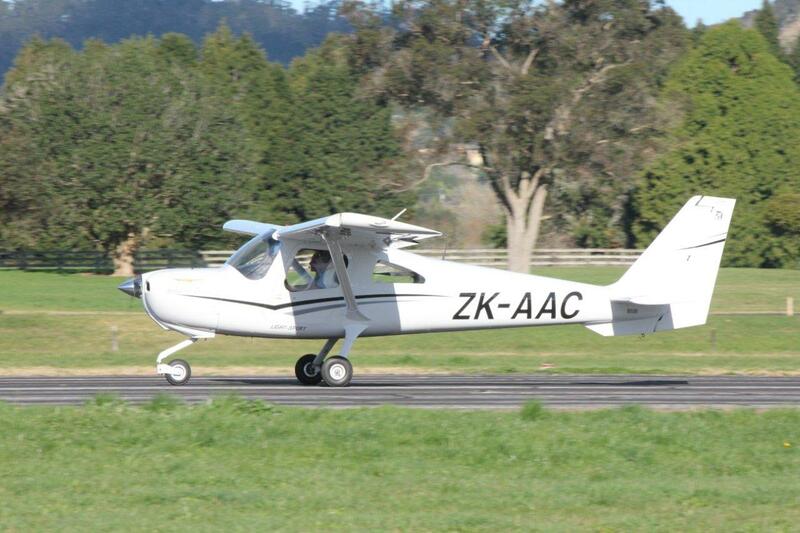 Cessna 182R Skylane ZK-NPC (c/n 18268096) was operated over the 2001/2002 summer and Seneca ZK-TBF was replaced by Piper Pa34-200T Seneca II ZK-MIE (c/n 34-8170056) in April 2002. 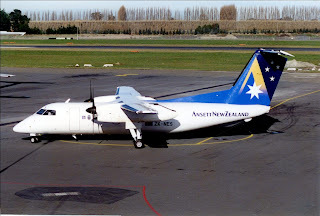 Alpine Air's Piper Seneca ZK-MIE at Timaru on 18 August 2002. 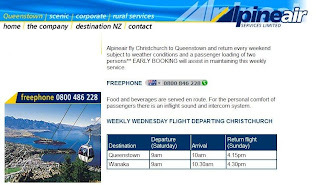 In early 2003 the company moved its base to Christchurch and tried offering a new Christchurch-Wanaka-Queenstown service which operated southbound on Saturdays and northbound on Sundays. This service failed to generate much interest and by early February 2005 the last aircraft, Seneca, ZK-MIE, had been sold and the company had ceased operating.